I ate too much during the holiday season, plus the few months before the holiday season, and a little too much in the week following the holiday break, and A LOT in the actual week of the holiday break. To make up for it, I'm cutting back just a tad, and by a tad I mean eating a lot of healthy things. Because if it's healthy, it doesn't really count, right? This reasoning led me to finally try Angelica Kitchen. Bezzy McBez, our token vegetarian, and I went out on a movie date and ended up discussing how neither of us has ever eaten at Angelica even though it's been around since we were babes. It just seemed too crunchy, and granola, and healthy, and om-y. AKA the perfect dinner spot for two 'I'm on a healthy kick' ladies. While I went for the beet salad, Bez went for a special. I can't recall the exact name, but it was vegetarian chili with a side of quinoa and surprisingly delicious. Meatless definitely doesn't have to mean bland, and the quinoa's nutty flavor added to an already excellent chili. The only real problem came from huge broccoli florets that needed cutting, but that's hard to achieve with no knife available. If we were on dates, it would take some serious finagling to eat those gracefully. Now my salad, the Si Se Puede, wasn't the worst, but it wasn't mind-blowing. 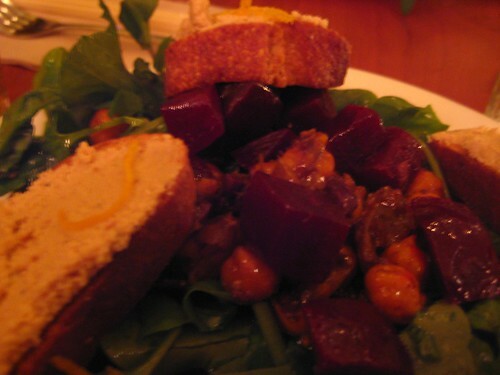 Just a normal beet salad, chickpeas, greens, a very tarty dressing, and these crostini topped with tofu ricotta. The crostini were the best part, mainly because they tasted a little decadent compared to the greens. But Bez and I both LOVED the dessert, a Blueberry Kanten. See the layers, like a trifle, or a sundae. Those layers seemed to be an apple butter cream, layer of crunchies, more apple butter, more crunchies, and more apple butter with three blueberries. 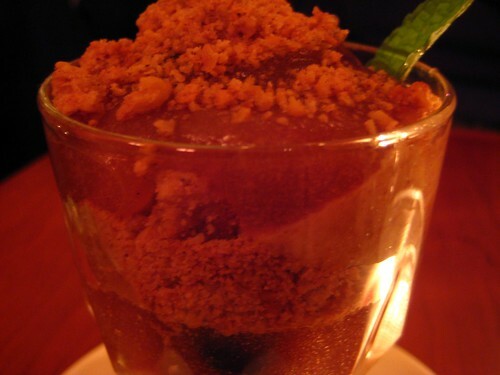 Did I mention the crunchies that tasted like graham cracker crumbs? Like pie crust! If you like graham cracker pie crust, and I don't know a soul that doesn't, and apple, you'll love this. I want to make some and place it on ice cream. Mmm, that would be delicious. You know, after I get off this healthy kick. Be warned! Angelica Kitchen is stuck in 1990 and is cash only. I went to Angelica's Kitchen back when I lived in ny last year and was really excited about it. That is, until I was hungry again an hour later--super healthy food seems to do that to me. Then again, I didn't have dessert, and the blueberry kanten looks good! 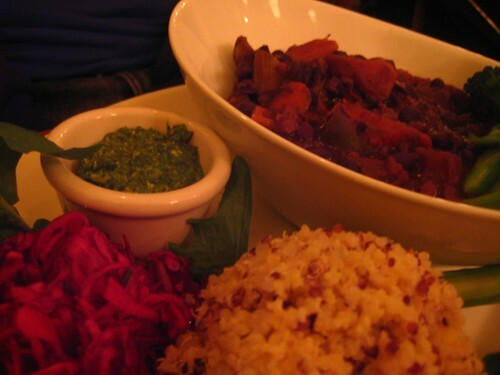 Angelica Kitchen is my go-to spot for vegetarian food! Next time try their wheat gluten burrito, it's slathered with this amazing barbeque sauce. I also love their chili and corn bread. I also had their apple pie with maple tofu whip and it was heavenly.